Microsoft has withdrawn its request for an oral hearing to respond to European antitrust charges arising from its bundling of the Internet Explorer Web browser with its Windows operating system. If Microsoft indeed abused its market position, it has become fairly obvious the company's efforts were unsuccessful: Firefox now leads IE 7.0 in European market share. While Microsoft, with its three versions (6, 7 and 8) of Internet Explorer still leads in overall browser usage, StatCounter says that so far in 2009, Firefox 3.0 is slightly ahead of Windows 7.0, each with approximately 34 percent of the market. With it's three versions, Microsoft captures an overall 49 percent share. 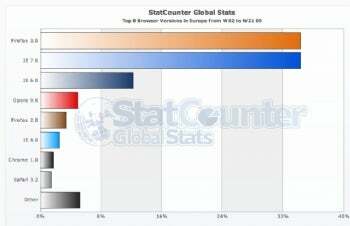 More Europeans now use a non-Microsoft browser than use Internet Explorer. Microsoft remains a major player in the European browser market, though its dominance is decreasing over time. In recent weeks, both IE and Firefox have lost share as Opera has enjoyed major increases. Microsoft had been granted the hearing to explain its position before a ruling is issued in the case. However, the request was withdrawn after the EU refused to move the hearing from June 3-5, a time when Microsoft said many important European antitrust officials would be attending a conference in Zurich. "Many of the most influential commission and national competition officials with the greatest interest in our case will be in Zurich, Switzerland, and so unable to attend our hearing in Brussels," Microsoft said. Holding the hearing when many officials would be unable to attend "would deny Microsoft our effective right to be heard and hence deny our 'rights of defense' under European law," Microsoft added. With Microsoft's browser share waning--some have described the drop as being "like a ton of bricks"--the EU rulng, when it comes, might do more to present Microsoft from competing with surging competitors than protect those competitors from the formerly dominant Microsoft. David Coursey tweets as dcoursey and may be reached by email using the contact form at www.coursey.com/contact.